At the Xbox E3 press conference today, Microsoft unveiled a new Xbox One Elite wireless controller. The Elite wireless controller will feature swappable thumbsticks and d-pad, with a "pro level" of precision on both. Buttons can be remapped, and underneath there are "hair trigger locks" offering selectable levels of pressure on the triggers. Pricing wasn't announced, nor did Microsoft say whether this bad boy will work as a wired controller with Windows 7/8, but we do have a nice video to look at it. 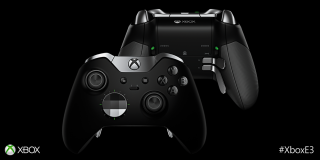 Update: More information about the new Xbox Elite Wireless Controller, which is expected to come to market in October, is up now at Xbox com—including a whopping $150 price tag. A bit steep, no? This better be one mighty fine controller indeed.